Love pets? Love food? 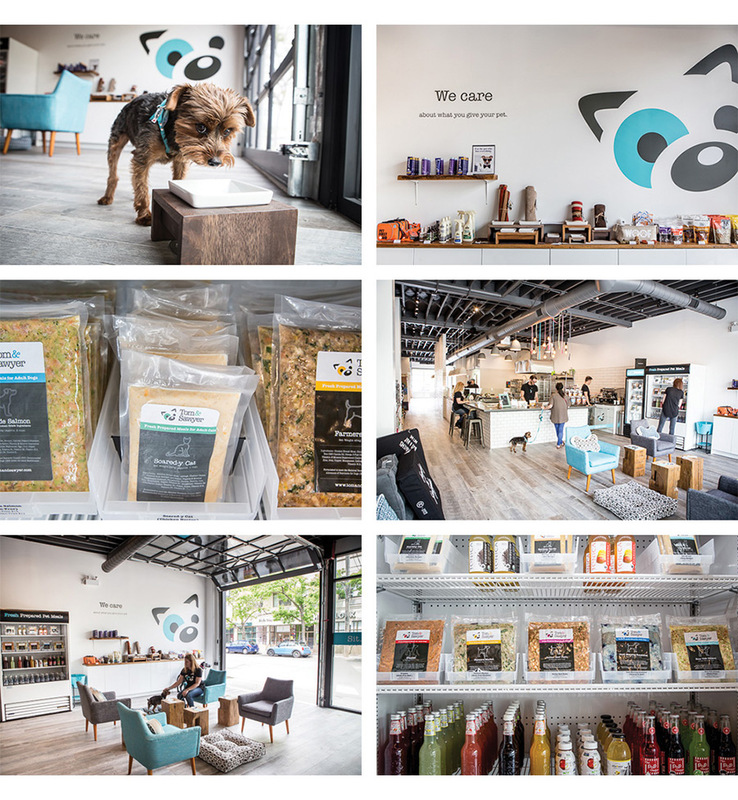 Then we’re sure you’ll love the behind the scenes look at how we helped build Toronto’s trendiest health-focused pet meals brand from the coffee shop to the kitchen. We love pets. In fact, my dog comes to work with me every day and ensures that at some point in the day he takes “me” out for a walk to help me clear my head and step away from the screen for a bit, even if just to brainstorm without the distraction of email and the flashing light on my office phone. In the fall of 2015, Kristin Matthews and Peter Zakarow invited me to sit down for a coffee in order to chat about a new business venture they were embarking on; Tom&Sawyer Pet Meals. Having worked with Peter previously on another project, and having created a beautiful logo and website design together, I was happy to accept the invitation and welcome the challenge of collaborating on the creation of the new brand, packaging, and website design for their Toronto-based startup. Tom&Sawyer Pet Meals was created with a fundamental goal to feed not only Kristin and Peter’s dog, Sawyer, but to feed everyone’s pet with fresh and healthy human grade meals, just like the rest of the family. In the eyes of Kristin and Peter, Tom&Sawyer Pet Meals had to be created. Pet food, in general, is poorly regulated and many people unknowingly feed their pets sub-par pet food that lacks important nutrition, let alone true enjoyment for their pet. Under the guidance of a veterinarian and pet nutritionist, Tom&Sawyer Pet Meals and their small team of passionate pet parents created a menu of freshly prepared pet food that only contains ingredients found in your average refrigerator. Now with their newly opened brick and mortar shop and café in Leslieville, pets and their humans, can come to enjoy a uniquely casual experience with food, snacks, and beverages. Fortunately for everyone involved in the creation of Tom&Sawyer’s Pet Meals brand, there was no hard timeline or budget, which allowed everyone to work at a comfortable pace and thoroughly consider and explore many different ideas at each and every phase of the brand design project. Through our initial strategy session with Kristin and Peter, we began with the logo design and what would become the cornerstone of the brand. Our Toronto website design company, Parachute Design has a fun questionnaire we like to run through with all of our clients. The questionnaire is full of what seems like silly off-the-cuff questions that stealthily help us better understand the personalities behind the brand we’re tasked with creating. Through this process, we also identified the target audience as local males and females aged 25-65 with above-average disposable income. Additionally, a key piece of the online business model focuses on customer’s ability to create a subscription through the website in order to have freshly prepared pet food delivered right to their door without having to visit the brick and mortar shop. Tasked with the creation of a complete brand that covers multimedia from scratch is a tall order in and of itself. Fortunately, Parachute Design has been honing our craft as a Toronto-based web design company for nearly 15 years and we’ve stockpiled the experience and track record to tackle these projects head-on with confidence. Our approach to web design for startups is organised and straightforward. As with all branding projects, we kicked off with a fun questionnaire to help us establish how founders Kristin and Peter not only envisioned the brand but also what type of personality they wanted to weave into the brand from their personal lives and experiences. When paired with competitor analysis and loads of experience working in the pet food marketing industry, we were able to create a brand that encompassed the key points of our collective goals and research to offer a distinct and appealing look for the target audience. The Tom&Sawyer Pet Meals logo design was especially unique in that along with our initial doodles and sketches, Kristin also offered her own ideas on paper throughout the concept development process. In some revisions, Kristin would take our sketch and make it her own to illustrate alternative ideas and various other forms we could explore before landing on the final logo design applied to Tom&Sawyer marketing materials today. This process was truly the definition of working together with our client to create a winning logo and brand that everyone could be proud of. Jay and his team at Parachute Design listened to our story and helped us to develop our logo and brand, which we love, as do so many people. Parachute Design was able to translate our ideas and messaging into a visually appealing brand design that has provided our fresh prepared pet meals with a strong introduction to the pet food market. Once the new Tom&Sawyer Pet Meals logo design was established it was time to expand the brand across all the various materials needed to launch the new business. This included everything from business cards and product packaging to the interior and exterior signage. Having an in-house graphic designer on staff, Tom&Sawyer was able to handle various forms internally, such as apparel and labels, while Parachute Design took the lead on the major marketing pieces for the initial launch in order to build a solid brand foundation. Together, through some brainstorming sessions and some trial and error with forms and sizes, we put together a clear and contemporary package design that could be managed in-store to meet the needs of the staff preparing the fresh pet food meals each day. We continued the brand expansion by tackling both the interior and exterior signage while the Leslieville café shop was being renovated ahead of the official launch. This required a couple trips down to the job site to take measurements, chat with the sign maker, and get a sense of the space before we applied the brand elements throughout. 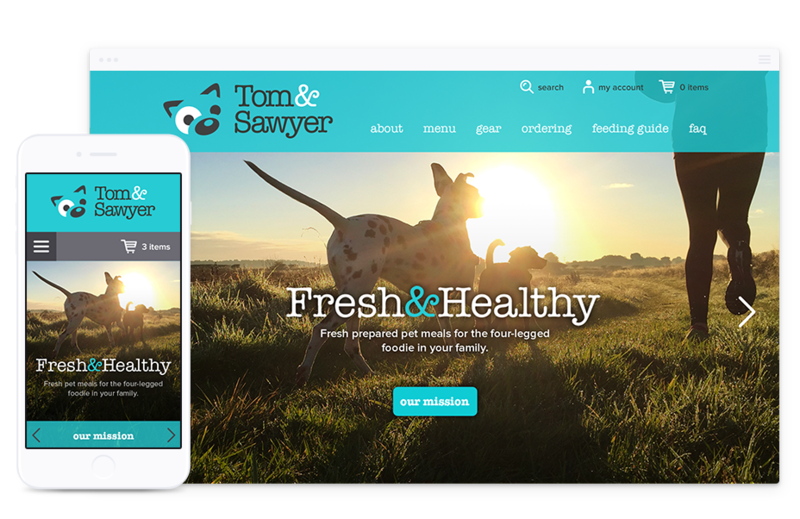 Throughout the brand extension Parachute Design also provided design and user experience consultation for the new Tom&Sawyer Pet Meals website design. After aligning with the web developer and reviewing initial wireframes, we tackled the responsive website design in order to continue the brand expansion through the web and online shopping experience. Key points we identified early in the website design phase included creating a focal point on the food and ingredients where applicable through the use of custom photography. The web design showcases beautiful meals dressed up for human consumption to reiterate the promise that all ingredients in Tom&Sawyer pet food is human grade and straight from your refrigerator. Additionally, we aimed to showcase each individual ingredient through the use of thumbnail images that when interacted with offer more information on the benefits added in each meal. This was perhaps our first opportunity in quite a while to be involved with both the packaging and interior/exterior signage on the ground floor. I’m always eager to expand my knowledge and awareness of design materials and techniques available to both designers and clients, in order to solve new and evolving challenges. Taking part in conversations with specialists in these fields was exceptionally educational and creates the opportunity to carry this knowledge into future logo design, packaging, branding, and website design projects. As with most startups, time and budget are potentially the two defining factors in determining not only the project scope and timeline but also everyone’s feeling on the final results. 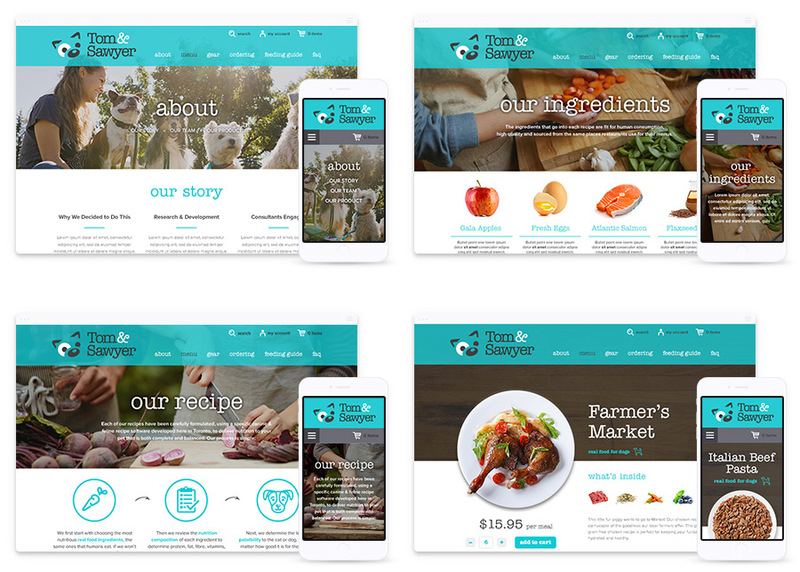 Having the time and space to research and explore more than a handful of design options in this Tom&Sawyer Pet Meals branding project ultimately provided our client with a logo and website design they were able to fall in love with and showcase with pride. If possible, when approaching an endeavour such as this, granting your web designer a little extra freedom and time to do what they love will often yield far more successful and passionate results. Based in Toronto, Ontario, Parachute Design offers a wide range of services including brand and logo design plus responsive website design for startups. To learn more about how our Toronto web design company can help you with logo design, branding, and web design for your new startup company, or to request a proposal, please complete our online quote request form, or call our Toronto branding and website designers at 416-901-8633.